Whether traveling with family or friends, my two-bedroom townhouse condominium is a perfect place to stay. Located within easy walking distance of town, the condo gives you the option of dividing your day into periods of activity and periods of relaxation--some time to shop and some time to relax in the hot tub which is available to guests in any of the 8 units of the condominium. By staying at My Alpine Place, you will be able to start your days at your leisure with breakfast in a charming, fully equipped kitchen (still in your robe with your bed-hair if you do mornings as I do). We leave a guest package in the kitchen--enough for you to start your day - and there is a convenience store very near-by. If you have collected laundry during your travels, you will find a washer and dryer in a utility closet in the kitchen. When you are ready, Leavenworth is a 10-minute stroll away. If you have children, it may take longer as you pass Icicle Junction on your way, a favorite stop for my granddaughters. My young one likes the rides; my teen prefers the spa. Icicle Junction, the town pool, and the local library are the areas set up to provide activities for children. You pass all three in the short walk to town. We have WiFi but you can check email at the library if you wish. The librarian will provide a guest pass for ½ hour on the library computers. Enjoy the surrounding landscape as you walk. It did indeed inspire the development of this Bavaria themed town. Across the street from the condo you will find Osprey Rafting, with great rafting trips. Waterfront Park with its great trails and birding is also within walking distance of the condo. If you decide to take the car out of the carport, you have a great selection of outdoor activities. Winery tours are one option. While local wineries are all represented in Leavenworth at the various tasting rooms, driving to their locations is a different experience. Icicle Ridge Winery in Peshastin has lovely grounds with weekend music, paired dining experiences and child friendly day tours. Silvara, located outside of Leavenworth, has a lovely location and award winning red wines. Wedge Mountain has award winning white wines. Check out your options at the tasting rooms and then take to the road for a day. If you're more interested in outdoor activities, hiking trails abound. Serious hikers and/or backpackers will need to file planned trips with the forest service, but day hikers have endless options. Like to fish? Take a picnic and head to Fish Lake. Or Lake Wenatchee. Evenings are quiet here. Restaurants remain open, and you can choose your spot based on your palate. If pizza is on the menu, I recommend the Leavenworth Pizza Co (894 US Highway 2). You may eat there or order take out and eat in the comfort of your kitchen. If you are interested in a fine dining experience with locally sourced, sustainable foods on their menu, you will find that as well. You face a problem of overchoice--which is not a bad problem. If you wish evening entertainment, you will find that several of the restaurants offer live entertainment. Certainly, you should consider going to the theater while staying here. Look on line and buy your tickets in advance. I have seen The Sound of Music several times. It is well done, and it always sells out. There are outdoor and indoor theater venues as you prefer. OR spend a quiet evening in the hot tub — a personal favorite — a time to enjoy the wonderful night skies. The hot tub/picnic area is for use by those staying in the Icicle Condominiums (8 units), but often you will have the area to yourselves. I am a retired school teacher. While I live in California, I grew up in Leavenworth. I have a second property off of Icicle Road, a home set on a 5 acre site, surrounded by trees that my dad planted in the 1970s. I visit Leavenworth regularly as I have family here. Indeed, should you need help while staying at the condo, you have contact information for my cousin who lives in town. I bought the condo because of its proximity to town. I find many advantages to lodging within walking distance of my destination. I can take downtime as I wish-- as can those with whom I'm travelling. If travelling with children, it's possible to take a break. Not everyone has to have the same agenda. It's just easier. Downtown is an easy walk from the condo, roughly 10 minutes all on sidewalk. As you approach town, you can look down on the Wenatchee River and the park area. The town is charming: restaurants, art in the park on weekends, festivals, theatre, shopping. You'll be glad of your close location as you walk past town parking lots. The condo is across Icicle Road from Osprey, a river rafting company during the summer months and a ski rental company in winter. Bear Island and the riverfront park are within walking range. Mountains surround the valley here, a perfect setting for a Bavarian Village. No central air, but there is a window AC unit in one bedroom. Both bedrooms have ceiling fans, and there is a ceiling fan in the kitchen. We also keep two oscillating fans at the house. Basic items: coffee, tea, salt, and pepper. The kitchen if fully equipped--dishes, pots and pans, coffeemaker, toaster, full size range. Should you wish to cook, you certainly can do so. We have WiFi for our guests, but please be aware that it is illegal to download copyrighted materials. We will forward contact info to parties that log a complaint about copyright infringement. The brick patio area near the outdoor hot tub contains deck chairs, lounge chairs and a picnic table. The hot tub is shared by occupants of the 8 units in the condominium association. The condo has a window air conditioner in the master bedroom. Both bedrooms have ceiling fans. There are also two portable air conditioners, and an oscillating fan. The living room has a comfortable, queen sofa sleeper, and a 36 inch television with basic cable service. There is also a DVD player. I do not have a video library. Video/DVD rentals are available at Leavenworth Video. The local Safeway also rents videos. Or bring favorites from home. If you are traveling with sports equipment (bikes, kayaks, golf clubs, backpacks, etc), you will find a large storage area behind the carport where you can safely lock your equipment. The Leavenworth area is a wonderful place for bike riding, and the 18-hole golf course is truly beautiful. It was nice to have a washer and dryer on the premises, as well as a modern kitchen with all the amenities. This place is very convenient to walking downtown. The beds are comfortable and the place is very clean and cozy. Talk about perfect for us. Clean, quiet and restful. My Alpine Place is a perfect distance from town for a nice walk each day to the best coffee in WA state. Our hosts were extremely easy to contact and very helpful getting us into the facility. Carolyn checked that we were settled. The beds are spotless and comfortable. The unit is well equipped so that we did not need to bring anything to start our stay. We stayed 2 months and would make this our destination if in the area again. Nice, clean and comfortable. 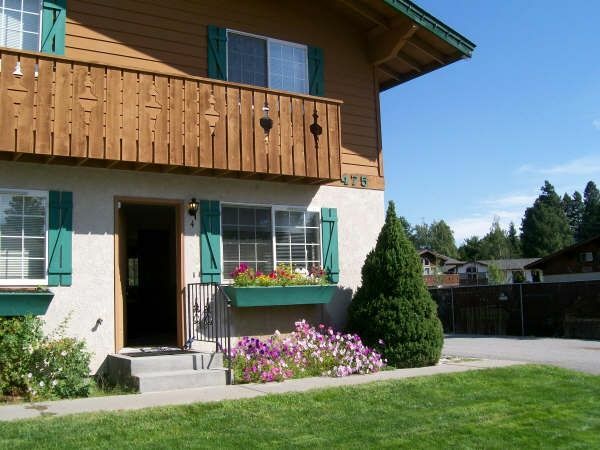 Nothing too special, but very adequate and conveniently located a few blocks from the center of Leavenworth. Comfortable and clean! Good living room/hangout area for friends and family. Easy 10 minute walk into town. Hot tub is a great perk! Would definitely stay here again! Leavenworth is a storybook town inspired by the surrounding landscape. Under the blue skies of spring, summer and fall it is lush with flowers. In winter, costumes, early snowfall, children sledding in the park and Old World architecture appeal to visitors like the fantasies on holiday cards. For me, the town is a reminder of how much effort exists between the vision and the reality. The park of my childhood was simply a lawn, not even a necessarily well kept one. The buildings along Main Street housed a pharmacy, a hotel, a hardware, and a collection of bars. Now, as I enjoy presentations in the park, I remember my Dad helping to build that park gazebo. I knew the merchants who borrowed to convert 1920’s buildings into the magical town you see. As you enjoy the festivals, the food, the shops, try to imagine the courage required to borrow enough money to actually make a dream come true.